Did you see this in the Atlantic a few days ago? If not, well, here it is. Paul Alivisatos, director of Lawrence Berkeley National Laboratory, Eric D. Isaacs, director of Argonne National Laboratory, and Thom Mason, director of Oak Ridge National Laboratory wrote an open letter, published on the Atlantic website, stating their view that the sequestration will set back basic research for a decade. You may be saying to yourself, no big deal. Let private companies take over. Except private companies have decreased their research budgets dramatically over the last decade. Or you could say, well, what’s so important about all that research? Or even, oh, they’re just exaggerating. Maybe. Guess we’ll find out. 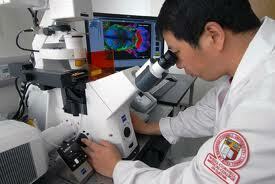 Just remember, while we’re cutting research funds, China is increasing them. Cutting the meager amount the federal government spends on basic science would do little to meet short-term fiscal goals while incurring huge costs in the future. Most of the talk about sequestration has focused on its immediate impacts — layoffs, furloughs, and cancelled White House tours in the days and weeks ahead. But one severe impact of the automatic spending cuts will only be felt years — or even decades — in the future, when the nation begins to feel the loss of important new scientific ideas that now will not be explored, and of brilliant young scientists who now will take their talents overseas or perhaps even abandon research entirely. Less than one percent of the federal budget goes to fund basic science research — $30.2 billion out of the total of $3.8 trillion President Obama requested in fiscal year 2012. By slashing that fraction even further, the government will achieve short-term savings in millions this year, but the resulting gaps in the innovation pipeline could cost billions of dollars and hurt the national economy for decades to come. As directors of the Department of Energy’s National Laboratories, we have a responsibility both to taxpayers and to the thousands of talented and committed men and women who work in our labs. We are doing everything we can to make sure our scientists and engineers can keep working on our nation’s most pressing scientific problems despite the cuts. It’s not yet clear how much funding the National Labs will lose, but it will total tens of millions of dollars. Interrupting — or worse, halting — basic research in the physical, biological, and computational sciences would be devastating, both for science and for the many U.S. industries that rely on our national laboratory system to power their research and development efforts. Instead, this drop in funding will force us to cancel all new programs and research initiatives, probably for at least two years. This sudden halt on new starts will freeze American science in place while the rest of the world races forward, and it will knock a generation of young scientists off their stride, ultimately costing billions in missed future opportunities. New ideas, new insights, new discoveries — these are the lifeblood of science and the foundation of America’s historic culture of innovation and ingenuity. The science community recognizes the importance of those new ideas, so we have systems in place to make sure great new ideas get a chance to thrive. Every ongoing federally funded science program is reviewed regularly to make sure it’s on track and likely to yield results. Each year, stalled programs are terminated to make room for more promising lines of research. Under sequestration, we will continue to review and cull unsuccessful research efforts, but we won’t be able to bring in new ideas to take their place. Every federal agency that supports basic scientific research is facing this impossible dilemma. The National Science Foundation — which funds 20 percent of all federally supported basic research at American colleges and universities — just announced it is cutting back on 1,000 new research grants it had planned to award this year. The Department of Energy’s Office of Science, the nation’s largest supporter of basic research in the physical sciences, will have to shut the door on hundreds of new proposals as well. The impact will multiply as long-planned and overdue supercomputer upgrades and other necessary investments in our scientific infrastructure are stretched out, delayed, or put on hold indefinitely. The National Laboratories aren’t just crucial to America’s scientific infrastructure. They are also powerful engines of economic development. Nobel Prize-winning economist Robert Solow has calculated that over the past half century, more than half of the growth in our nation’s GDP has been rooted in scientific discoveries — the kinds of fundamental, mission-driven research that we do at the labs. This early-stage research has led to extraordinary real-world benefits, from nuclear power plants to compact fluorescent bulbs to blood cholesterol tests. Because the United States has historically valued scientific inspiration, our government has provided creative scientists and engineers with the support, facilities, and time they need to turn brilliant ideas into real-world solutions. Basing funding decisions solely on short-term fiscal goals risks the heart of America’s scientific enterprise and long-term economic growth — diminishing our world leadership in science, technology and in the creation of cutting-edge jobs. Sequestration won’t have an immediate, visible impact on American research. Laboratories will continue to open their doors, and scientists and engineers will go to work. But as we choke off our ability to pursue promising new ideas, we begin a slow but inexorable slide to stagnation. We can’t afford to lose a generation of new ideas and forfeit our national future.